All the very best wishes to Megan! Fingers also crossed for that blanket, and just about everything crossed that you’re where you need to be when you need to be there! She’s looking great – and still high! My first literally waited until his uncle (who’d been saying You have to wait until I’m home) got to the hospital. He’ll wait for you (or be the BEST home coming present EVER). You’re thinking like a grandma. Ask your inner doula how many healthy first babies are early. Just concentrate on pacing that knitting (not too close to done, not too far away) and it should keep the gerbil-brain occupied till you get home. At which point the sprog will decide to take another week. Just knit. Just knit. She’s still carrying high, no need to worry until that baby drops! Exactly and she doesn’t look tired. Wow. My fingers (and toes) are firmly crossed that you’ll be home to be with Meg when that wee grandchild arrives, and you’ll have the blanket ready to wrap up that precious bundle. Megan looks wonderful! And I agree, baby still seems high. You will get back in time. Happy knitting! It’s OK Stephanie, depending on when that pic was taken it doesn’t look like your grandchild has started his “trek” downward! But I would suggest Meg spend most of her time lying down!…..with her legs raised!…..as high as she can get them!… At this point, ANY gravity might NOT be your friend! Be that as it may, don’t be “hopeless”. That blanket is filled with so much love there isn’t any room for hopelessness to get it’s grimy fingers hooked! Just relax, breathe, and revel in the fact that you have the wonderful talent to create such a special gift. 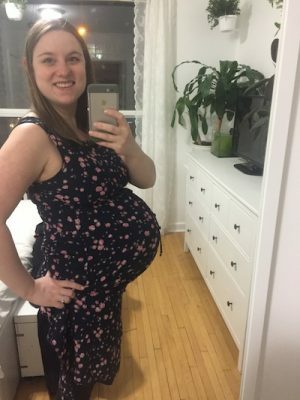 Megan swallowed a basketball! All in the belly. She looks great. Best wishes for a safe delivery and fingers crossed that it is after grandma arrives home! Sending love and calm. Baby, wait for Grandma, please. Calm baby thoughts, calm baby thoughts. Stay put, baby, you don’t want Grandma to miss this. The baby will come when it’s good and ready, and no amount of panicking will change that. I’m sure Megan wants you to be there, too, whether or not the blanket is done. She still has a smile on her face, so I’d say all is well. Breathe and knit, breathe and knit. I think you should probably go the other way on this one and start knitting faster. That baby is waiting for his grammy to come home. Just wondering if you’ll be knitting him little socks while Megan labors. She’s still smiling, so I’d say you have plenty of time. Now when it seems more like a grimace-you’d better hurry! Deep breath. First baby. When are they early? My first came on his due date (and he’s been prompt ever since). Still “high”. Probably not gonna whoosh out while you’re gone. Megan still looks happy, doesn’t have that slightly deranged “get this outta there” look yet so I think you’re safe. But don’t slack off knitting. Better be done early than trying to count stitches in the delivery room. P.S. I had to touch the House, not the Airplane. Proof that you’ll be home in time. looks high to me too but round like a little girl – do you have a pool for what it is going to be? Hurry home , that pose won’t last very long I’m thinking! It’s a boy; they have already announced it. Best wishes to all of you! Meg, you look wonderful! I have to ask – when you are away from home do you carry the blanket with you at all times? I know you are in safe places with people you mostly know, but still – it must be hard to leave that much hard work and something so special in a hotel room! Meg looks incredible! I think you will back back in time to greet your grandson; the power of The Blog is behind you. Don’t sweat it! All’s well that weaves in her ends well. Oh lord, Meg! She looks happy and radiant, though. By the time I was like that with either of my boys, I was a mess and looked it. And babies come when they’re ready, trust me. My second one was 3 weeks early. He didn’t wait for anyone. Best wishes to Meg for a smooth and easy labor and delivery when the time comes! She looks wonderful! And good luck to you too Stephanie to get that blanket done. I bet it will be gorgeous. I wish I could take a class with you this weekend, but if I see you passing by in the marketplace, I might fangirl squeal just a little. How wonderful to be a birth coach/doula (my apologies, I’ve forgotten your exact title) at a time like this in the family. If this wee guy is like my two were, you’ve got another 2 weeks to wait! Hoping you are there for the miraculous moment. Baby’s come when baby’s come. That’s just how they are! Have you started his advent calendar? Meg is gorgeous! Love the belly. Baby will come when it is ready, blanket or no, and Meg is still smiling. Here’s hoping that everyone can make the event…and that it doesn’t occur before Tuesday AM! Hope that baby waits for you! Every time I see a picture of Meg, and I’m looking for them now, she looks more and more beautiful. Just amazing and it makes me feel good to look at her. You just have to know this baby is going to be so perfect. Between Meg’s baby and April the Giraffe, it feels like the whole internet is waiting for babies! Here’s hoping Elliot arrives like a wizard, never early, nor late, but precisely when he intends to. She’s so beautiful with your grandchild sticking out like that!!!!! Megan, you look beautiful. Grandma, you better keep knitting. Is it a full moon this weekend? Full moon started all 3 of my labors. Hoping all goes well. That’s one glowing pregnant mama! Best wishes to Megan, you, and the rest of the family! Hoping the little one holds out for you… I’ve been feeling an enormous solidarity with you, and Meg, and wee grandson-to-be, since I’ve been on the same journey as Meg, with only a slightly earlier deadline (that photo! that was me last week! I still look like that in my mind’s eye — postpartum is a trip). Congratulations on your son! Hang in there, Mama. “Ahhh faith” my irish grannie midwife would say. They come when they are ready, and the little blessings don’t have calendars, and do not care one whit about schedules. So, did you call this entry “Bomb” because of the bomb scare at the airport today involving a flight from Toronto to Chicago, or was that a coincidence? Your travel schedule exhausts me, but it’s always impressive! Yeah, I was wondering about that. It seemed a risky title for sitting in the airport with! No, Megan is the ticking time bomb! Meg wears pregnancy well! She is lovely. Congratulations to your whole family, what an exciting adventure. That new grand baby is certainly wrapped in a beautiful package! Meg is glowing. Congratulations and best wishes to all! Knit really fast. There is not much time on the meter. I agree…she is still high. But Tuesday is the Full Pink Moon and we all know maternity wards are very busy during a full moon. She’s glowing!! You are a doula. You are the grandmother. You need to be there. If she goes into labor, drop everything (retreat be damned) and get the first flight home! These are women (mostly). They get it. Meg looks fabulous! Just keep knitting. It isn’t done until the blocking and drying, so no worries if you get the knitting part all done. You got this, Grandma, you got this. Meg looks wonderful! Hoping the little man stays put until you’re home. She looks amazing! My little guy came 3 weeks before his due date, *but* in the photo that was taken of me two days before he was born you can almost see me thinking, “I’m not gonna make it, I’m going crazy, someone get this baby out of me NOW”, and Meg definitely still looks happy…so hopefully there’s something to that! Best wishes to you all! I’m taking your class Saturday morning, and I look forward to getting a real-time update! Meg is beautiful and her baby will be, too! I can’t wait to see him! Meg looks amazing! So does the blanket. Babies come when they are ready (or not), mine were all early – so knit Stephanie, knit!! Good luck on all counts. I am very excited for Meg, you and your family (and a little weepy that it’s 5 years since I was in a similar condition with my April baby! She arrived bang on her precise thanks to IVF due date!) I hope all goes smoothly and that you are home in time and have the completed blanket ready to wrap him up in. I also can’t quite believe how long I’ve been reading your blog, since before I got married and had two babies myself, wow. Meg looks lovely! Still carrying high and she doesn’t look tired like I sure did in my 9th month(s)! Fingers crossed that the baby decides to wait out the weekend. My first was due on 3/31 and finally decided to appear on 4/19, 32 years ago. April babies really are the best!!! 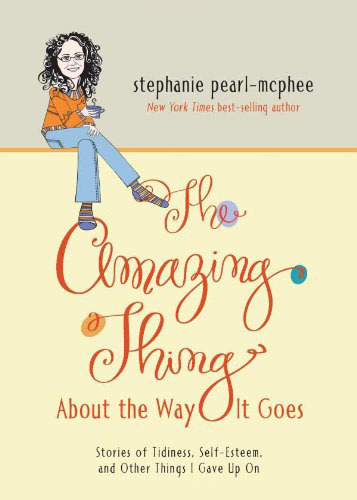 I totally get the stress you are going through, Steph, and love hearing every little superstition or trick you use to make things turn out the way you want. But you know, don’t you, that the minute the little person arrives, you won’t even remember this part. Also I agree with everyone else, that smile on Megan’s face means she is happy to keep baking that little one for a while yet. Agreeing with everyone that Meg looks wonderful! Thanks to you and her for sharing all of this with us. Looking forward to a picture of the little man. How does she do it; Meg looks fantastic! and happy. Breathe, relax, & knit knit knit! You can do it Steph! Meg looks fantastic! And I’m sure the blanket will be done BEFORE the arrival. …if that baby gets much bigger, he’ll be playing basketball in the delivery room! Knit faster, Harlot! Such a beautiful picture of Meg! Your blanket is coming along wonderfully well and it will be amazing when it is finished. Happy thoughts only while knitting and infuse that precious blanket with positivity. All will be well. Sending prayers, positive vibrations, and loads of happy wishes your way. Ah Megan, you’re still gorgeous! It’s all going to be good I just know! Still, fingers crossed. love to you all! Love to Meg and her son for an easy and healthy delivery, and to you on the traveling and the knitting and the timing. She looks so well! I’m keeping my fingers crossed that you make it home in time! I can’t wait to see this baby and all the amazing things you knit for him. 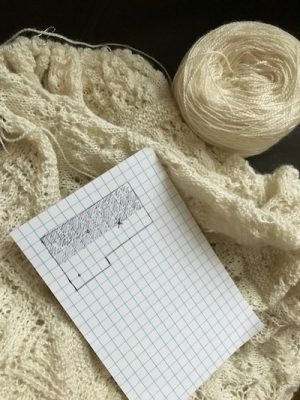 Would you consider selling any patterns as a fundraiser for Meg? It would be like The Blog’s baby shower present for her. That is one AMAZING belly! You and Meg are both very close to being done… won’t be long now! She looks fantastic….and that baby is still mostly above the belly button so USUALLY that means you’ve still got time. But this is your family we’re talking about so fabulousness may not take as much baking time as mere mortals. Looks like both of you are right on schedule! Have a wonderful time at DFWFF. She is beautiful and glorious and I wish her a safe and healthy birth (after you get home). We have a grandbaby due on the 25th and our daughter looks a lot like that. I will hold my breath until he or she is here . Looking forward to meeting the new person. Stephanie, it was lovely to see you today! When they announced that Megan was in labor and you had gone to be with her the entire auditorium erupted in applause! Texas loves you, and we wish you and Meg the best of luck and happiness! I can only imagine excitement amongst your family!!!!! Best wishes on the arrival of your newest family member! Grabbing popcorn and settling in for the weekend. I know late pregnancy is tough on the body but if you take a few days more to finish the blanket, Meg can enjoy the feeling of the little one in her belly a few days more. I know I really missed that after my son was born even though I was so happy to finally have him in my arms. Best of luck to you and your loved ones! Best wishes to the mother-to-be!! What an exciting time for everyone! Texas released her back to Canada with good wishes to all of them! Wow! When I read Sarah Ross’ s post above (about the auditorium erupting in applause when it was announced that you had gone back to be with Meg) I teared up a bit picturing that. Best wishes to everyone, crossing my fingers that you made it in time! If it’s any condolences the weather in Texas is gorgeous right now. I should know I live here. On that note I wish you made your visiting schedule more apparent or I would have requested off for you coming down here. She’s got the belly, but doesn’t look like she’s dropped yet. You’re probably good til Monday, will keep fingers crossed for you. Never mind, saw the above comments about labor starting, good luck Meg! According to the picture of Meg, the baby hasn’t dropped yet. As soon as that baby drops down, then you have to worry. I think you still have about a week. Maybe less but only time will tell. Good luck to you all and congratulations on your grandchild. Meg, you look terrific. Keep sharing pics of the belly so we know when the baby is in prime birthing position please? Amendment, didn’t read the previous comments before posting. Hope all is well and I know you are so excited. Congratulations. Sorry you cut your trip short. But glad you went to be with your daughter. Congrats Grammy!! Looking forward to watching your newest family member grow and develop. Congratulations, Grammy, being a grandma is the best! I’m so happy for you and your family.